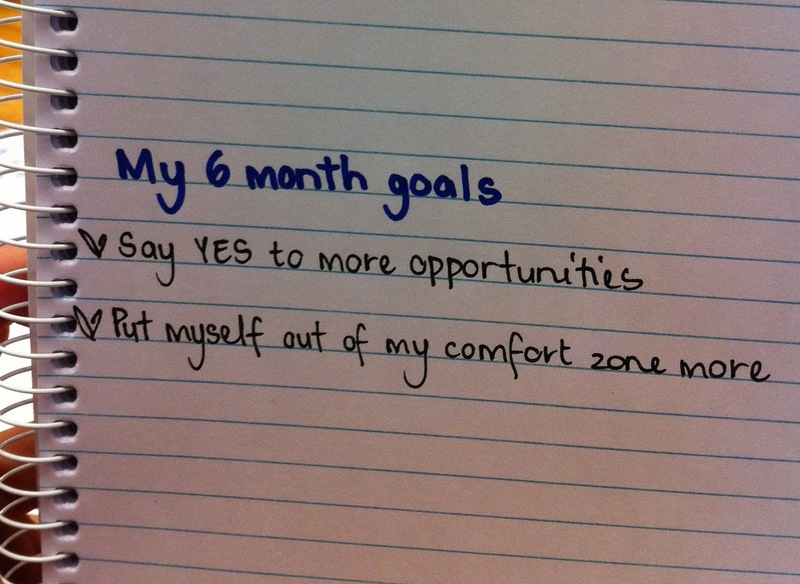 I swear I can trace my goal setting attitude right back to my year 6 teacher - Ms Sommers. I'll never forget the first day of year 6 when she told us to put our books away & instead pull out one piece of white paper and write our goals for the term, and then for the year. Admittedly I can't remember my exact goals I wrote but at 11 years old you can safely assume they would have included 'Get good grades' and the ever important 'make nice friends'. Obviously her method sunk in as Twelve years on I am still setting yearly & half yearly goals without fail. It gives me so much satisfaction to look back at my list at the end of the year & tick off which ones I've achieved. This brings me to my new half yearly goal that I wanted to share with you though as we are fast approaching July! To say yes to more things and step out of my comfort zone wherever possible. The first part is easy, the trick with achieving this one will be to better manage my time even more so I can actually fit in whatever it is I am saying Yes too! The hard one is and will be actively making choices that see me pushed beyond my comfort zone & learning new things along with it! I'm excited by the challenge & will no doubt keep you updated on if and how I'm achieving my goal.